Collection of graphic notation conditionally supports, clamps and mounting devices used in technical documentation. 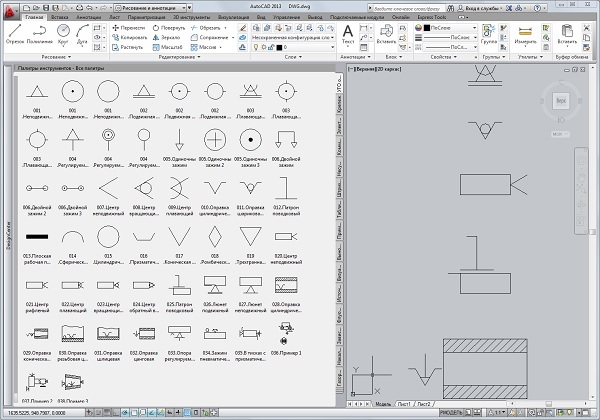 Sections of the documentation: Graphical symbols for use on mechanical engineering and construction drawings, diagrams, plans, maps and in relevant technical product documentation. Created by: GOST 3.1107-81 "Unified system of technological documentation. Supports, clamps and mounting devices. Symbols ". TAGs: engineering drawings, mechanical engineering technology. The archive also contains the halyards, made as a standard drawing format, DWG, compatible with AutoCAD 2000-2016, Compass, ZWCAD, nanoCAD, BricsCAD etc.